Low carbon heat: if not now, when (and how)? Decarbonising the UK’s heat supply is a massive challenge, but like other aspects of the energy transition, it also presents significant opportunities for investors, developers, consumers and others. On 3 July 2018, an Energy Breakfast event at Dentons’ London office explored the subject of investing in low carbon heat. The speakers were Richard Taylor of E4Tech, co-authors of a recent study on future heat infrastructure costs for the National Infrastructure Commission (NIC), Stuart Allison of Vattenfall’s newly established UK heat business, Jenny Curtis of Amber Infrastructure and Nick Allen of the Department for Business, Energy and Industrial Strategy (BEIS). We summarise here some of the key issues from their presentations and the lively discussion that followed, as well as one or two related subsequent developments. It may seem perverse to try to debate policy on any form of artificial heating at a time when much of the UK has been enjoying near-record high temperatures for what feels like several weeks, but it was only a few months ago that the country saw an almost equally notably cold start to spring. The heat sector, at present mostly fuelled by burning natural gas, accounts for about one-third of UK greenhouse gas emissions. The sector’s emissions will have to be largely, if not completely, eliminated by 2050 if the UK is to meet the emissions reduction targets set under the Climate Change Act 2008 – let alone the more demanding targets that may flow from the 2015 UNFCCC Paris Agreement objective of keeping increases in average global temperatures well below 2oC. One way of decarbonising heat would be to substitute hydrogen for methane as a fuel. It is possible to mix some hydrogen (or biomethane) with natural gas and still use existing pipeline networks and appliances. But full decarbonisation by this route would require significant investment at both the wholesale and end user levels (replacement of metal with plastic pipes, new boilers). And that is just the start. The hydrogen has to be produced on a large scale – probably using methane as a feedstock, which would produce a stream of CO2 that would need to be captured and either stored or used in a way that avoids its being released into the atmosphere: in other words, more investment in substantial infrastructure, and the commercialisation of technologies (such as CCS) which have so far been slow to develop, even though they would appear to be an important part of the future of the oil and gas industry. Significant changes to existing downstream gas regulation are also be required, to accommodate both blending of hydrogen with methane and full conversion. And all this assumes that popular misconceptions about the safety of hydrogen do not prevent its widespread deployment. Alternatively, decarbonisation of heat could be achieved by switching from boilers to a system built around heat pumps and storage, and running the heat pumps on decarbonised electricity. This would require significant action at the wholesale level (e.g. additional generating and network capacity) and a radical change in infrastructure at the end user level (e.g. each household either acquires a heat pump of its own or becomes part of a district heat network attached to a much larger heat pump). Between the scenarios focused primarily on hydrogen or electrification, there are some hybrid options, and it is arguable that the replacement of existing natural gas-based heating could efficiently take different forms in different parts of the country (for example, those areas not connected to the existing gas grid are likely to be more cost-effectively served by heat pumps than by hydrogen). But it is clear that unlike in the case of electricity generation, where the Government has been able to adopt a broad policy of encouraging a range of low carbon technologies and regulating the pipeline of new capacity by adjusting the level of subsidy and the ease or difficulty of obtaining planning permission for each of them, in relation to heat it is likely to have to make some fundamental, long-term choices at the outset between the competing pathways to decarbonisation. Put at its starkest, in the next 30 years, existing gas pipeline networks are likely to have either to decarbonise or cease to operate. All of this points to the conclusion that decarbonising heat will be harder than decarbonising the generation of electricity. At the wholesale or system level, it will be very hard for Government to avoid making major strategic choices between competing heat technology options, rather than just letting the technology mix evolve within a managed framework. End users will have to take (or be coerced into taking) a much more active role in the heat decarbonising process than the vast majority of them have had to play in decarbonising electricity. Finally, as further explained below, the interaction of decarbonising heat with adjacent areas of activity is likely to be harder to predict and manage. In one sense, none of this is news. In the ten years since the Climate Change Act, the independent Committee on Climate Change (CCC) have repeatedly highlighted the challenges of the heat sector in their reports. In their latest progress report to Parliament, published on 28 June 2018, the CCC invite the Government to “apply the lessons of the past decade or risk a poor deal for the public in the next”. Examples from the heat sector feature in support of each of the four key messages that the report delivers: support the simple, low-cost options; commit to effective regulation and strict enforcement; end the chopping and changing of policy; and act now to keep long-term options open. The CCC note that progress on decarbonisation to date has been heavily focused on electricity generation. Heat and other sectors will need to catch up if the fourth and fifth carbon budgets (set under the Climate Change Act for the years 2023-2027 and 2028-2032 as staging posts on the way to the final 2050 target of 80% emissions reduction against 1990 levels) are to be met. The CCC identify a number of specific actions required of Government to be on track to meet the fourth and fifth carbon budgets. In the shorter term, they highlight the need for further action to deliver cost-effective uptake of low-carbon heat, including low-carbon heat networks in heat-dense areas (e.g. cities) and increased injection of biomethane into the gas grid. 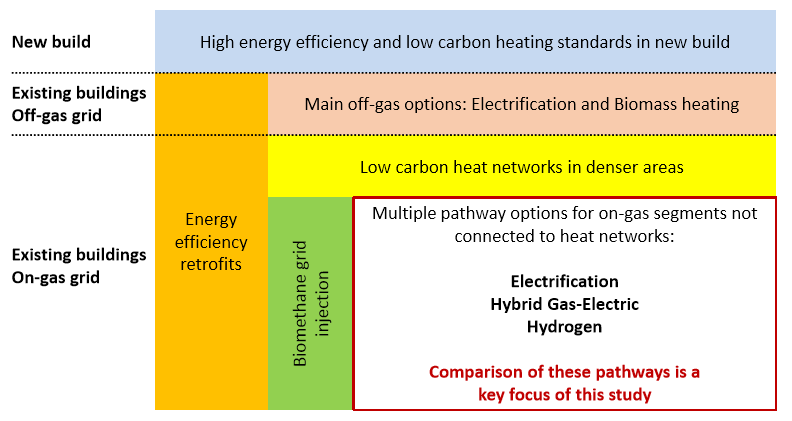 The long-term choice between heat decarbonisation technologies and the desirability of low-regrets measures such as energy efficiency measures and low carbon heat networks in areas of dense heat demand are reviewed in an Imperial College report for the CCC (the executive summary of which was published alongside the CCC’s 28 June 2018 report as well as in E4Tech / Element Energy’s report for the NIC. Both cite the CCC’s 2016 visual representation of these measures and choices. Element Energy / E4Tech’s version of this is reproduced below. In his presentation of the E4Tech / Element Energy conclusions, Richard Taylor stressed that although the hydrogen scenarios appeared to be slightly cheaper, significant uncertainties remained around the level of additional costs associated with each of the long-term options, shown below in comparison with the “no change” option of maintaining a natural-gas based heating sector. Both reports have a wealth of more detailed analysis. 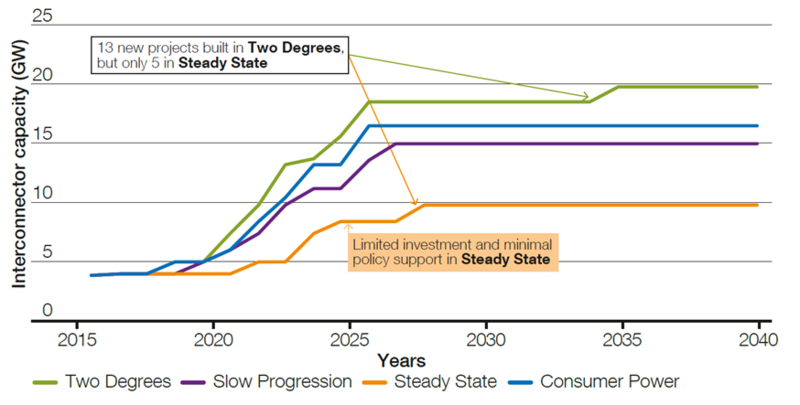 For example, this chart from the Imperial College report highlights the potential implications for the optimal levels of installed capacity in the electricity generation sector of different heat technology / intensity of emissions reduction scenarios (the figures 30, 10 and 0 underneath each bar refer to target CO2 emissions in Mt). Unsurprisingly, significantly more capacity is required in the electricity based scenarios, but it is also interesting, for example, how much the nuclear element in the mix varies between options, and that even the electricity based scenarios include a substantial hydrogen component in the form of open and combined cycle gas turbine plant using hydrogen rather than natural gas as a fuel. Heat networks: how low is the low-hanging fruit hanging? Why is the development of heat networks identified as a “low regrets” option for the shorter-term, more or less regardless of what choices the Government may make about heat in the longer term? A heat network is a system comprising a heat production unit and a network of pipes and heat exchangers through which the heat that it produces is distributed, in the form of steam or hot water, to the heating and hot water appliances in a number of different customers’ premises (rather than each customer’s system of such appliances having its own heat production unit). The concept of a heat network is technology-neutral. The heat production unit could, for example be a boiler (fuelled by methane, woodchips or hydrogen) or a heat-pump (sourcing its heat from the air, the ground, or a body of water such as a river or lake, or the water that collects in old mine workings). Broadly speaking, whatever technology you use to produce heat, in areas where the demand for heat is sufficiently dense, it is likely to be more efficient (and – where the technology involves combustion –to result in lower carbon emissions) if the heat is generated in bulk and distributed to individual buildings or households around a local network (as steam or hot water) rather than each building or household having its own heat production equipment (e.g. boiler or heat pump). Heat networks are obviously easiest to install when a building is first constructed, although retrofitting may also be cost effective in some cases. 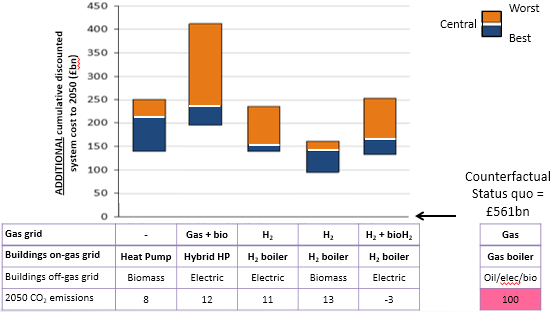 If care is taken in designing a heat network, it may well also be possible to switch between heat production technologies at a lower overall cost at a network level than it would be for an individual building or household to do so (for example, by replacing a single large gas-fired unit with a single large heat pump or a hydrogen-fired unit, rather than replacing the heat production equipment in each individual customer’s premises). Moreover, consumer research commissioned by BEIS shows that those served by heat networks are overall as satisfied with their heating as those who are not. Heat networks, then, have much to commend them. There is considerable investor interest in heat networks. BEIS has even published a list of 10 infrastructure investors who are actively interested in investing in them. Planning policy both at central and local government level has for many years encouraged the installation of heat networks in new residential and commercial developments and the seeking out by those building new thermal electricity generating plant of potential network uses for their waste heat. 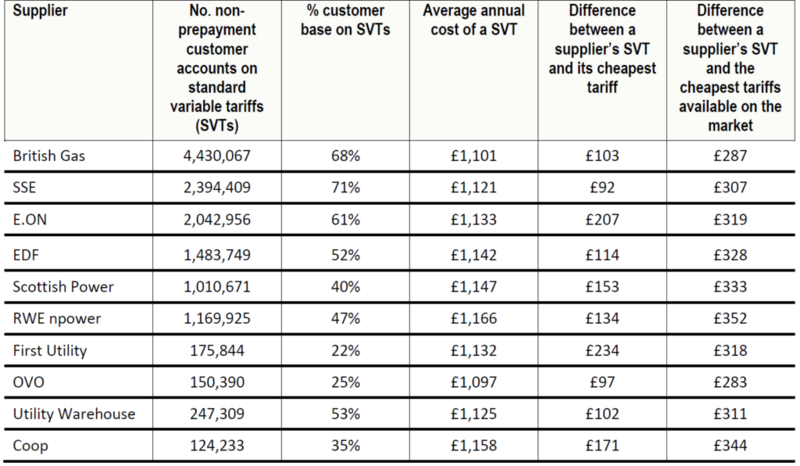 And yet, at present, only 2% of UK demand is connected to a heat network, although as much as 20% of demand may be sufficiently densely located to benefit from a heat network solution. An increase in heat network capacity features in all three clean growth pathways in the BEIS Clean Growth Strategy. But connecting 20% of demand to a heat network by 2050 would imply an annual growth rate of 8-10%. Will this be feasible? The short answer is: feasible, yes – but not easy, for a number of reasons. Complexity: It is easier for a developer to arrange a gas supply to a group of new premises and fit each of them with its own natural gas-fired boiler than to establish a heat network to serve them. Opting for a network solution immediately raises a series of questions and requires a much wider range of issues to be taken into account. Who will design, build, own and operate the network? Whoever does each of these things, more contracts will need to be negotiated than for a non-network solution, where all that is needed is a gas connection and a contract to supply / fit some boilers. In many new developments, there are a lot of different stakeholder interests to balance (the developer, others with responsibility for the network, different landlord and tenant interests, local authorities and so on). If the same organisation does not have responsibility for all aspects of the network, agreement will have to be reached on a whole series of risk allocations. One common solution is for a developer to install a network but then to seek to recover some of the expense of doing so by selling it (or the right to operate it) to an energy services company (ESCO), but the building of a network by a party that will not operate it in the long-term can result in poor quality installation. Lack of standardisation: Heat network projects can therefore quickly develop lengthy risk registers, but there is no universal approach to or methodology for allocating those risks, and, as a result, not as much standardisation of contractual provision – on terms that strike a fair balance between competing stakeholder interests – as is desirable to keep costs under control in a sector where most transactions have a relatively small value. Economics: The economics of what may at first appear to be promising heat network projects sometimes do not quite stack up. The relatively small size of transactions can make it hard to leverage debt in. Perceived shortcomings of the technology: Notwithstanding that there appears to be no overall problem of customer satisfaction with heat networks, concerns remain about the lack of customer control (e.g. over heating, in networks where the necessary valves have not been fitted in individual premises). As in any consumer market, one or two prominent bad reports, e.g. of poor service or over-charging, can unfairly skew stakeholders’ views of the technology as a whole. However, none of these problems is insuperable and, as we shall see below, steps are being taken to address all of them. Go Dutch – and regulate for growth? Discussion about the UK’s failure – so far – to make the most of heat network opportunities often includes reference to other countries, including a number in Continental Europe, where their use is widespread and longstanding. The inference is that since we have failed to see the benefits of heat networks for so long, it will be an uphill struggle to do better now: it’s too late for us to become Denmark / Poland / [insert your European heat network exemplar country of choice]. However, Vattenfall’s experience suggests that it is possible to spread heat networks through a major European city, starting from scratch. Before 1994, Amsterdam had no significant heat network provision. Since then, starting with the use of waste heat from a new energy from waste plant, the city has been steadily building out a heat network which is expected to help it to go “gas-free” by 2050 – and the trend is spreading elsewhere in the Netherlands as well. There are perhaps only three major structural differences between the UK and Netherlands markets. The first is that the supply of natural gas in the Netherlands is taxed more heavily, providing an additional economic incentive for heat networks, particularly those using non-methane energy sources. The second is that strategic planning for the rollout of heat networks in Amsterdam is considerably facilitated by a joint venture between a Vattenfall entity and the city itself. The third is that heat supply / networks are regulated in the same way as electricity and gas networks / supply. In the UK, the heat networks sector is not currently subject to the same kind of regulations as comparable services such as electricity and gas, and this has raised concerns about standards of quality and consumer protection. The Heat Network (Metering and Billing) Regulations 2014 offer some consumer protection including by imposing billing obligations and the requirement for all new heat network customers to be given a heat meter, however they do not provide for a standard of customer service or recourse to an independent complaints review process for unsatisfied customers. The heat network industry also has its own consumer protection scheme, the Heat Trust, which sets a common standard for the quality and level of customer service, and provides for a complaints handlings system, including access to an independent complaints review by way of access to the Energy Ombudsman. However, the scheme has no statutory underpinning, membership of it is voluntary and it currently only covers a small proportion of the existing heat network customer base. In December 2017, the Competitions and Markets Authority (CMA) announced they were launching a market study into domestic heat networks to ensure that consumers using heat networks are getting a good deal. The study set out to examine whether consumers are aware of the costs of heat networks both before and after moving into a property; whether heat networks are natural monopolies and the impacts of offering different incentives for builders, operators and customers of heat networks; and the prices, services quality and reliability of heat networks. The CMA published its initial findings on 10 May 2018.It notes that, overall, the average prices on the majority of heat networks within the sample considered were the same or lower than that of comparable gas-heating, and the overall satisfaction (and dissatisfaction) of customers was in line with that of consumers not on heat networks. Nevertheless, there were instances of poor service quality and cases where customers were paying “considerably more” than for non-network heat. The CMA is concerned that the factors driving instances of poor performance or unduly high pricing should not become “embedded”, to the detriment of customers, as the sector expands. Specifically, it looks at “misaligned incentives between property developers, heat network operators and customers of heat networks”; the monopoly nature of heat networks and the delivery models used for them; and lack of transparency on prices “both pre-transaction and during residency”. It finds that regulation is needed to ensure that heat network customers receive levels of protection comparable to those afforded to customers in the gas and electricity sector. The report recommends the introduction of a statutory framework, which would give formal powers to a sector regulator. This conclusion echoes some of the recommendations and analysis of a 2017 report by Citizens Advice Scotland. The CMA’s recommendations also go beyond the imposition of a regulatory framework for network operators to encompass possible changes to planning and building regulations, leasehold arrangements and property sales disclosures (including energy performance certificates) to take into account the specifics of heat networks. Changes to regulations in this area would give greater pre-contractual transparency to purchasers and tenants of properties to understand the implications of living in properties serviced by heat networks. A consultation on the CMA’s initial findings closed on 31 May 2018, with a full report expected by the end of the summer. There is clearly at least a substantial body of opinion in the industry that supports the conclusion that it would benefit from sectoral regulation: a well-designed regulatory scheme, rather than unduly burdening operators, would boost consumer confidence and help the industry to expand. Regulation could ultimately mean that operators’ returns may be capped, but the predictability that comes with well-designed and administered regulation could encourage investment. There would likely be other benefits as well: operators in economically regulated industries are typically also given a range of statutory powers that makes it considerably easier for them to do their jobs – such as compulsory purchase powers and “statutory undertaker” rights under legislation governing planning and street works. It seems unlikely that a sectoral regulation scheme for heat networks could be introduced without primary legislation, and there must be some doubt as to whether the Government will find the policy resource and Parliamentary time necessary to put such legislation in place in the short term. For the moment, the CMA has decided not to launch a formal “market investigation” – a step which would open up the possibility of imposing some remedies (but probably not an overall scheme of regulation) on the sector itself for any adverse effects on competition it found. However, the CMA has reserved the right to revisit this decision and those setting up heat network schemes may do well to take account of the conclusions of the current market study in any event. Attention to the CMA’s work and its possible inconclusive outcome in the short term should not distract from the valuable work that BEIS has been undertaking to remove or reduce some of the other key barriers to expansion of the sector. Earlier in 2018, BEIS provided details of a scheme to provide “gap funding” for heat network projects. The Heat Networks Investment Project (HNIP) is the vehicle for disbursing £320 million of Government money that was first earmarked for this use some time ago, building on the results of an earlier pilot scheme, and leveraging in about “£1 billion of private and other investment”. Following the appointment of a delivery partner, the scheme will formally launch in the autumn. Funding may take the form of grants, corporate loans or project loans. A number of criteria (both economic and technical / environmental) have been established for applicants to satisfy, perhaps the most important of which are those relating to “additionality”, designed to demonstrate that the applicant’s project would not go ahead without HNIP support – either because it could not otherwise raise the capital or achieve an adequate IRR, or because it would not otherwise be possible to fund additional technical or commercial features that are not required through planning obligations. guidance for those looking at combined heat and power solutions, in respect of the regulatory and commercial aspects of a project’s electricity output. The intention is that HNIP funding will create a pipeline of investable projects that will help the sector to become self-sustaining by 2021. As ever, success will lie in the quality of the implementation, but HNIP is a well-designed scheme that addresses many of the key issues facing heat network projects. Two other initiatives, not focused on heat networks, but also aimed at reducing barriers to lower carbon heat investments in the near term, are also worth mentioning. On 5 July 2018, BEIS published a response to consultation the confirmed the Government’s intention to help to introduce a support scheme to “overcome key barriers, and increase industry confidence to identify and invest in opportunities for recovering heat from industrial processes” (the Industrial Heat Recovery Support Programme). As part of a series of reforms to the Renewable Heat Incentive (RHI) subsidy regime for domestic premises, BEIS has brought into force changes to the rules on third party funding for heat pumps and other renewable heating systems. From 27 June 2018, under a procedure known as “assignment of rights”, the owners of such systems may assign the RHI subsidy payments to which they are entitled to a “nominated registered investor”. A model form of contract will be provided for doing so. It remains to be seen whether this will have the desired effect of encouraging more third party finance of heat pump installation and therefore materially greater uptake of heat pumps as a technology. whilst the Government’s acknowledgment of the need to look at the long-term technology options for moving towards a much lower carbon heat sector and to make some choices between them is welcome, there needs to be a more formal governance framework to drive enduring decisions on heat infrastructure in the early 2020s. In short, Government has made a good start, but must follow through. Moreover, in looking at the next steps for heat policy, Government and others need to take a holistic approach. We noted earlier the apparent importance of hydrogen in all three long-term heat decarbonisation pathways. Work carried out by Alstom also indicates the potential for hydrogen (which is much more energy dense than any battery) to be used in fuel cells to replace diesel as the fuel for trains on lines that have not been electrified and that it may never make sense to electrify. Is there not a case for incentivising the large-scale production of hydrogen (and CCS for the associated CO2 by-product) – perhaps through a contract for difference where the strike price is benchmarked against wholesale natural gas prices? Government is not just responsible for energy and transport policy. It has other, currently under-used levers at its disposal to encourage technologies that will decarbonise heat. The embedding in building standards of tougher rules on energy efficiency and an absolute requirement for low carbon heat supply to be part of all new buildings (and the rigorous enforcement of such standards), are obvious – but as yet untaken – steps that would increase demand for low carbon heating technology. There is of course an important interaction between energy efficiency improvements and heat networks, particularly in retrofitting situations where significant reductions in heat demand driven by improved building energy efficiency could undermine the business case for a marginal heat network project. With as with other areas of energy policy, sharper incentives from carbon pricing would speed up decarbonisation. In the heat sector, ways of preventing any higher taxation of gas from increasing the burdens on vulnerable customers would have to be part of the package. Finally, any long-term decision-making by Government or the private sector will also have to consider the need to accommodate, and perhaps encourage, the introduction of new business models, and the possibility that the market of the future may, and perhaps should, be less uniform than it is at present. Now, most consumers buy kWh (or cylinders) of gas (or in some cases, heat) and kWh of electricity (with a few of them generating a proportion of their electricity demand). Energy efficiency is largely a separate market, with the occasional imposition on gas and electricity suppliers of obligations to undertake a certain amount of more or less targeted energy efficiency improvement works for consumers. In the future, consumers might specify a set of outputs (e.g. availability of up to X amount of electricity, maintenance of indoor temperatures within a certain range) and sets of constraints or variables (e.g. payment profiles, willingness to allow the installation of particular equipment or energy efficiency measures, or to accept occasional deviations from the prescribed temperature range) and invite a range of suppliers to offer them a monthly price for home energy-related services for a certain period of time. These services could include anything from utility supplies of energy to the installation of new energy production equipment or energy efficiency measures. In a market where it will become ever easier for consumers to become “prosumers”, generating, storing and using their own electricity, companies that currently simply retail electricity and gas to consumers on a £/kWh basis may need to diversify their offering and learn a number of new skills if they are to maintain their relevance play a full part in the energy transition of the heat sector. If you would like to explore any of the issues raised in this post further with us, please get in touch. The assistance of Jennifer Cranston, a trainee in our London office, in the preparation of this post, is gratefully acknowledged. In a judgment dated 22 June 2018, the High Court (Lavender J) dismissed a challenge brought by a number of electricity generators (the Claimants) against a decision of the Gas and Electricity Markets Authority (Ofgem) to approve proposed modifications to the Connection and Use of System Code (CUSC), under which charges for use of the GB transmission network are levied. The modification proposals were formally made in May 2016; Ofgem’s decision was taken in June 2017; and it came into force on 1 April 2018. Its most noted effect was to remove (over a three year period) a key element of the revenues of small “embedded” generators (i.e. those connected to a distribution network rather than directly to the transmission network). Under one part of the transmission charging framework, known as the Transmission Demand Residual (TDR) charge, payments are effectively made in respect of the amount by which the supply of power from small embedded generators reduces consumption of electricity from other, mostly transmission-connected, sources in the periods of peak demand (known as “Triads”) from which the charge is calculated. These negative charges, commonly referred to as “Triad payments”, are typically made to electricity suppliers (as the small embedded generators themselves are not parties to the transmission charging arrangements), but the suppliers typically pass on about 90% of their value. The overall costs of the transmission network have increased significantly in recent years. So too have TDR charges and the amount of Triad payments accruing to small embedded generators. The Claimants, some of whom had made the development of small generating plants designed to capture Triad payments into a business model, argued that the system was rewarding them fairly for reducing the need for investment in the transmission network. Ofgem, drawing on work that had been done in preparing the CUSC modifications and a series of consultations leading up to its decision, formed the view that the small embedded generators were being rewarded excessively, ultimately at the expense of consumers of electricity. Whilst Ofgem acknowledged that they do make some positive contributions in reducing the amount of reinforcement necessary at Grid Supply Points, it drastically reduced the level of transmission charging related benefits that will be available to them in the future. The judgment of Lavender J is worth reading. At 36 pages, it is as concise a free-standing account of both the issues and the decision-making process as you are likely to find. The Claimants were refused permission to challenge Ofgem’s decision on grounds of irrationality. Their remaining grounds were that Ofgem failed to take account of material considerations and/or facts; and that the decision unjustifiably discriminated against the small embedded generators. On the first point, Lavender J found that rather than failing to take account of a material consideration by not understanding the argument the Claimants were making, Ofgem had engaged adequately with them and disagreed with their assessment of the contribution made by small embedded generation. (This had been in part a battle of expert economic appraisals, in which Ofgem’s decision was buttressed by LCP/Frontier Economics whilst the Claimants found support in criticisms of Ofgem’s approach made by NERA/Imperial College.) It was also not an error of law for Ofgem to require the Claimants to provide evidence in support of their case rather than making its own inquiries to find such evidence. The second point had two limbs. 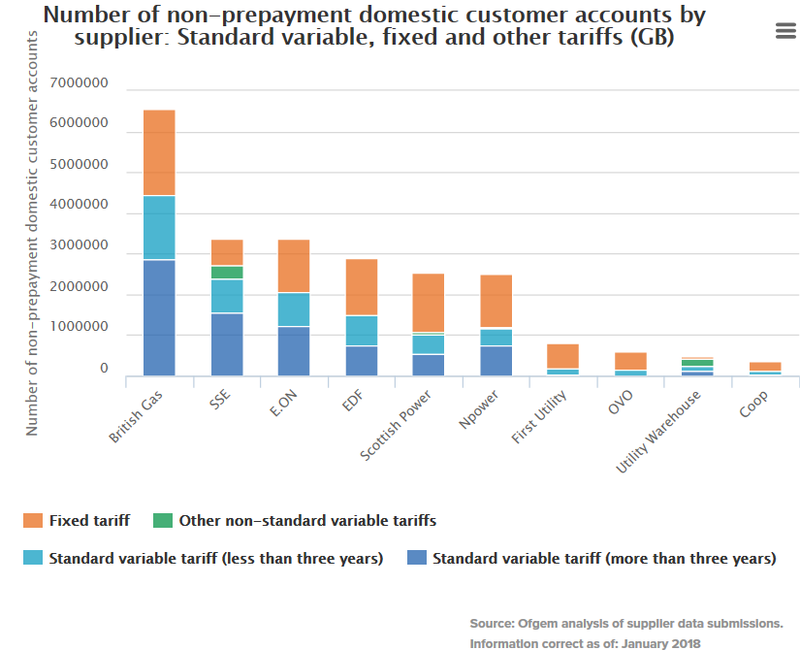 The Claimants argued that Ofgem should have treated them in the same way as providers of behind the meter generation (BTMG) and commercial demand side response (DSR), which, like them, reduce a supplier’s net demand for electricity – but that it had not done so. They also argued that it was unlawfully discriminatory to treat small embedded generators as if they were in a comparable position to transmission-connected generators – when they were not. The judge was satisfied that “looking in the round” there was “enough of a relevant difference between” small embedded generators and BTMG / commercial DSR on the one hand and transmission-connected generators on the other, to justify their different treatment by Ofgem. On a reading of the judgment with no more knowledge of the parties’ submissions than the judgment itself reveals, it does not seem very likely that it will be successfully appealed. Some readers may disagree with some of the judge’s reasoning, for example in support of his findings of “relevant differences” between the small embedded generators and BTMG / commercial DSR / transmission-connected generators. But as he points out, there will be scope to remedy any perceived unfairness in the context of Ofgem’s ongoing Targeted Charging Review: Significant Code Review. Ultimately this is one of those judicial review cases that serves as a reminder of the limits of judicial review as a mechanism for challenging decisions by economic regulators, as the court deferred to the expert regulator and did not appear to have thought that there was anything so bad in the decision under challenge or its results as to justify any attempt to use the essentially procedural categories of judicial review more creatively to strike it down. One can speculate whether the reasoning, if not the result, would have been different if Ofgem’s decision had been one that was subject to review by the Competition and Markets Authority rather than the court (like another recent Ofgem decision on a CUSC modification in the case of EDF Energy (Thermal Generation) Ltd v. Gas and Electricity Markets Authority, but even that process does not amount to a substantive reopening of the decision that is being challenged. When the CUSC modification was originally proposed, some may have felt that it was an attack on the small embedded generators by those seeking to develop new transmission-connected generation. For them, the Triad revenues of smaller generators enabled the latter to bid down the clearing price in Capacity Market auctions to a level which made it impossible for e.g. new combined cycle gas turbine projects to stay in the auction – thus losing their chance of a subsidy that would allow them to be built. However, two years on, the most recent Capacity Market auctions have not produced the higher clearing prices that might have been expected if the price was effectively set by small embedded generators and the latter depended to a material extent on the Triad payments they were about to lose as a result of Ofgem’s decision. This would suggest either that small embedded generators had more confidence in the Claimants’ case than appears to have been justified; or that, for whatever reason, Ofgem’s decision may be less harmful to their interests than it may at first have seemed. Meanwhile, Ofgem’s Targeted Charging Review has a long way to run, and it will be interesting to see whether it reaches its conclusion without legal challenge or two along the way. Those who wondered how President Trump would make good on his promise to put coal miners back to work now have their answer. On September 28 2017, Secretary of Energy Rick Perry dusted off a rarely used power in the Department of Energy Organization Act 1977 (DOEOA) and sent the Federal Energy Regulatory Commission (FERC) a proposal that it make a rule to “establish just and reasonable rates for wholesale electricity sales”. By this he appears to mean allowing coal-fired (and nuclear) plants to charge higher prices based on their contribution to the resilience of electricity suppliers. (Click here for the text of the Notice of Proposed Rulemaking (NOPR)). For many, the salient feature of US energy markets over recent years has been the astonishing ability of the unconventional gas industry to produce cheap fuel for power generation that allows new gas-fired plants to out-compete existing coal-fired or nuclear power stations. This new abundance of cheap gas has transformed not just the US, but arguably world energy markets, and along the way it has produced dramatic reductions in US greenhouse gas emissions. Conventional wisdom recognizes the importance of what are generally thought of as baseload generating plant in markets with increasingly high proportions of (often intermittent) renewable generation, and it has two answers to the question of how to make sure there is enough power when there is a risk that the lights may go out because there is not enough plant on the system that can run regardless of whether the wind is blowing, the sun is shining, or gas supplies have been disrupted as a result of extreme weather events. The first is to let the market function freely and hope that the ability of the most secure generators to supply power in extreme conditions will enable them to charge sufficiently high peak prices (albeit on a very infrequent basis) in the wholesale electricity market to allow them to remain in business. The second is to create a “capacity market” alongside the wholesale power market. The capacity market is then designed so as to ensure that resources that will ensure security of supply are maintained at times when it is threatened, by providing sufficient incentives to sufficiently reliable sources of capacity to remain available to keep the lights on. Rather than just waiting for a chance to charge extremely high prices at a few moments when other generators are unable to satisfy demand, they are paid a regular (but lower) premium for being available “just in case”. Politicians and politically sensitive regulators, if not free-market purists, tend to prefer the capacity market route, because it helps prevent wholesale prices from rising to what might seem excessive levels, and carries less risk that you will have to wait until the lights have gone out a few times before sufficiently reliable generators will act on the electricity market’s signal that it is worthwhile remaining in the market. As a result, capacity markets have been a feature of the US power industry for a number of years. Although subject to frequent rule-changes, one of their guiding principles, in theory if not always in practice, is to try to maintain a level playing-field between the different potential sources of capacity – which can include not only all forms of generation, but also demand-side response. The NOPR is a radical departure from this technology-neutral approach. The NOPR follows on from the Department of Energy (DOE) Staff Report to the Secretary on Electricity Markets and Reliability commissioned by Perry earlier this year (downloadable here). One of the conclusions of that report was: “Markets recognize and compensate reliability, and must evolve to continue to compensate reliability, but more work is needed to address resilience.” It drew a distinction between reliability (“the ability of the electric system to supply the aggregate electric power and energy requirements of the electricity customers at all times, taking into account scheduled and reasonably expected unscheduled outages of system components”) and resilience (“the ability to reduce the magnitude and/or duration of disruptive events, [which] depends upon [the ability of infrastructure] to anticipate, absorb, adapt to, and/or rapidly recover from a potentially disruptive event”). Reliability has sometimes been seen as synonymous with dispatchability – the ability of certain technologies to produce power on demand (as compared to “variable” renewables like wind and solar). Resilience on the other hand has often been seen more in terms of the power system as a whole, and the need to improve the resilience of power transmission and distribution networks in the face of increasingly frequent and more severe extreme weather events has been a major driver of increases in network spending. Whereas some would regard gas-fired, coal-fired and nuclear generation as equally reliable, the report, and the NOPR, shift the focus onto resilience and see that quality in terms of the security of a generator’s fuel supplies. In simple terms, coal-fired and nuclear plants are more likely to carry stocks of fuel than gas-fired plants, which tend not to store reserves of fuel, but rely on pipeline supplies. Interestingly, however, despite the NOPR’s focus on “fuel-secure” plants that can store a 90-day supply of power on-site, such as coal and nuclear, the DOE Staff Report noted that “[m]aintaining onsite fuel resources is one way to improve fuel assurance, but most generation technologies have experienced fuel deliverability challenges in the past. While coal facilities typically store enough fuel onsite to last for 30 days or more, extreme cold can lead to frozen fuel stockpiles and disruption in train deliveries.” There appears to be a disconnect between the DOE Staff Report’s conclusions regarding fuel supply challenges for all forms of generation and Secretary Perry’s proposal to promote coal and nuclear plants, specifically, which might lead one to draw the conclusion that the move is more motivated by politics and the negative economic consequences to communities resulting from the loss of the retiring coal and nuclear generators and less by the attributes those resources offer the electric grid. The DOE’s proposed rule would require all regional transmission organizations (RTOs) and independent system operators (ISOs) (like MISO) to adopt market rules that would establish a rate applicable to generators able to store a 90-day supply of fuel on-site (i.e. coal and nuclear generators) that ensures that those generators recover their costs and a fair return on equity (the traditional cost-of-service pricing standard in the U.S.). In short, because coal and nuclear resources have not been able to compete in markets dominated by low-cost natural gas, the DOE is requesting/directing FERC to establish market rules that will pay them more in an attempt to stop the trend of the retirement of coal and nuclear plants. It is a surprisingly blatant attempt to have FERC, which has traditionally favored technology-neutral market rules, set up rules that subsidize specific technologies in order to prop them up. New York and Illinois have already started moving toward establishing a credit for nuclear generators as part of their programs to reduce greenhouse gas emissions in their states. So there may be some support at the state level for nuclear as a cleaner form of power. States have not been moving toward providing credits or subsidies for coal, however (except, perhaps, for those states whose economies are somewhat reliant on the coal industry), so we would expect to see some significant pushback from state governments as to the subsidy for coal. Also, to the extent that state programs are creating incentives for renewables to enter the market and FERC is creating incentives for coal and nuclear to stay in the market, ratepayers ultimately end up paying for both, even if both are not needed from an energy standpoint. If you accept the principle that coal and nuclear need “extra help” beyond what they can obtain from the current capacity market, to support their continued operation, there are of course many different ways that such help could be provided. There are also legitimate policy questions to be considered about the risks that in compensating such generators for the service they can provide in particular circumstances, you end up unnecessarily distorting competition in the wholesale power market as a whole. In short, an alternative approach to the resilience problem would be to continue with efforts to enhance co-ordination between wholesale gas and power markets and the development of gas storage capacity, and to improve interconnection between the US’s different regional power markets. In response to the NOPR, FERC staff have put together a list of 30 questions (many of them in several parts) for interested parties to comment on, teasing out both the principles behind the proposal and the potentially tricky details of its implementation (click here for the list). But there is apparently little time for either stakeholders or FERC to ponder all these questions, since the DOE has set forth a very aggressive timeline for this matter. It is directing FERC to take final action in the matter within 60 days, or in the alternative to adopt the DOE’s proposed rule as an Interim Final Rule subject to further change after opportunity for public comment. It states that the comment period will be 45 days or whatever period FERC sets out, if FERC can issue a notice establishing a comment period within 2 business days. The DOE also proposes that any final rule adopted by FERC become effective 30 days after it is issued and would require RTOs to submit a compliance filing proposing their tariff revisions to FERC within 15 days of that date. This is an extraordinarily accelerated timeline, particularly given the issues at stake and that most RTOs have a lengthy stakeholder process for developing new tariff revisions. Under the DOEOA, FERC is required to “consider and take final action on any proposal made” by the DOE expeditiously in accordance with reasonable time limits set by the Secretary of Energy. However, while FERC must act upon the proposal, it has exclusive jurisdiction, and thus complete discretion to accept, reject, or modify the DOE’s proposal. So FERC could issue an order rejecting the DOE’s proposal but initiating a similar rulemaking effort on a more realistic timeline. FERC issued a notice inviting interested parties to file comments on the DOE proposal by October 23, and reply comments by November 7. It is remarkable to see the oil and natural gas associations on the same pleading with the municipal utilities, coops, independent power producers, consumer groups, and renewable energy associations. Their motion argues that the proposed reforms laid out in the notice of proposed rulemaking would result in one of the most significant changes in decades to the energy industry and would unquestionably have significant ramifications for wholesale markets under FERC’s jurisdiction, and that the time frame allowed is far too short to consider such a significant change. Answers in support of their motion were also filed by the Transmission Access Policy Study Group, Industrial Energy Consumers of America, National Association of State Utility Consumer Advocates, Northwest & Intermountain Power Producers Coalition, and the American Forest and Paper Association. However, in spite of this unusual amount of industry consensus, FERC has denied the request for an extension of time and is holding fast to its October 23 and November 7 deadlines. It seems unlikely that FERC will be able to take any substantive action within the time frame set forth by the DOE (unless it rejects the proposal outright). Acting Chairman Chatterjee (Republican) issued a statement in response to the August DOE Staff Report on Electricity Markets and Reliability that FERC would remain focused on the wholesale electric capacity market price formation issues, so there may be some will at FERC to proceed with this rulemaking, but there is likely to be strong state resistance, and as the trade associations point out, it is not going to be an easy matter to figure out how to insert a cost-of-service pricing regime for coal and nuclear resources into otherwise competitive wholesale markets. The third sitting Commissioner, Democrat Cheryl LaFleur, endorsed Powelson’s comments on Twitter. FERC staff have indicated that the agency is moving forward with the proposal and will take “appropriate action” within the 60-day timeframe requested by DOE (as noted above “appropriate action” does not necessarily mean “substantive action”). It remains to be seen whether FERC will seriously entertain the DOE’s proposal, it could very well reject it quickly and go about business as usual, or (more likely) it could open an alternative proceeding to see if capacity and resiliency issues can be addressed through a better vehicle. Secretary Perry has stated that his intent in filing the proposal was to “start a conversation.” FERC is one of the federal agencies that is typically the least impacted by changing political tides, and we do not expect to see the type of radical change in direction that has been seen in other agencies, such as the DOE, EPA and Interior. Further, as described above, the commissioners have been telegraphing that they support markets and are unlikely to “blow them up,” but they have generally acknowledged that there have been significant changes in the industry that have put new pressures on the markets that may warrant taking a new look at whether there are attributes that the market is not pricing now that should be priced. Earlier this year FERC conducted a two-day technical conference on the topic of how FERC’s markets are impacted by state goals (such as increasing reliability and decreasing emissions) and whether FERC markets should remain completely independent of such goals, seek to accommodate them, or seek to accomplish them. Making predictions in the volatile scene of U.S. politics has become an increasingly dangerous game in recent months, but it seems that the most likely course of action for FERC to take regarding the DOE’s filing will be to wrap it up into the ongoing considerations of the markets and establish a more robust rulemaking to consider whether any and all of the attributes that the DOE and states are seeking to promote should be priced in the markets, most likely through a technology-neutral mechanism. On 29 September 2017, Ofgem published two storage-related consultations on possible modifications to the standard licence conditions of electricity generation and distribution licences. Ofgem and the Department for Business, Energy and Industrial Strategy (BEIS) are minded to classify storage as a sub-set of the regulatory category of generation. Clarifying the regulatory framework for electricity storage: licensing elaborates on this proposition and comes with a full set of generation standard licence conditions marked up to show the resulting changes. Consistent with this approach, Ofgem takes the view that distribution network operators (DNOs) should not operate storage facilities – just as (with only minor exceptions) they are not permitted to operate generating stations. Enabling the competitive development of storage in a flexible energy system: changes to the electricity distribution licence provides some more detail in this area and includes a draft standard licence condition 43B to keep generation and storage generally separate. Take generation first. To begin with, Ofgem gives us a definition of storage: “the conversion of electrical energy into a form of energy, which can be stored, the storing of that energy, and the subsequent reconversion of that energy back into electrical energy”. This comes with a list of technologies that Ofgem thinks the definition covers, which seems fairly comprehensive. The definitions of “generating station”, “generation business” and “generation set”, would all be revised to include reference to storage. A huge number of generating stations that are connected to DNO networks in GB operate without holding a generation licence. Clearly it would not be practicable for every household with a few solar panels on its roof to be required to hold a generating licence, but plenty of commercial generation operators also benefit from the statutory licence exemption regime. Exemption from the obligation to hold a generation licence is more or less automatic up to 50 MW and is frequently granted by BEIS up to 100 MW. It is generally thought that a licence-exempt generator stands to gain more than it loses by not holding a licence. Licensees must shoulder a greater regulatory burden, complying with a range of industry codes such as the Balancing and Settlement Code. This potentially gives them a voice in industry self-governance, but few small generators have the resources to make much of that opportunity, and many prefer simply to avoid the associated costs of code compliance. Among the other, relatively limited perks of licensed status is the ability to use compulsory purchase powers against recalcitrant landowners in order to develop infrastructure. It is conceivable that some storage providers may find those compulsory purchase powers useful. Of perhaps more general interest is the prospect that as a licensed storage operator, you would not be subject to “final consumption levies” (FCLs) – the charges that are imposed on suppliers (and therefore in most cases passed through to their customers) to fund the Renewables Obligation, Feed-in Tariffs, Contracts for Difference and Capacity Market payments to generators / capacity providers. That could persuade some who would not otherwise have to apply for a new storage-friendly generation licence to do so: the rationale is that those who are only operating an intermediate stage in the value chain between generation and final consumption should not be liable for FCLs just because their interaction with the wholesale electricity markets comes through a licensed supplier. But this is where it starts to get tricky. Storage technology, particularly some kinds of batteries, are becoming significantly cheaper. Ofgem does not want every large industrial user, for example, to go out and buy a battery as a way of avoiding FCLs. So a new Condition E1 is proposed: “The licensee shall not have self-consumption as the primary function when operating its storage facility.” But as Ofgem notes, the notion of a facility’s “primary function” could be defined in many ways. More generally, it is unfortunate that BEIS and Parliament do not currently have time to regularise matters fully by incorporating the new generation and storage definitions into the relevant legislation, but on balance, Ofgem’s approach of starting with the licence provisions seems a legitimate and pragmatic first step given the importance of clarifying this area. Turning to the DNOs. According to Ofgem, the existing rules “are clear that the DNOs cannot directly own or operate large-scale storage over 100MW. However, because generation below this threshold does not require a generation licence, there is a grey area where DNOs can own smaller scale storage”. The underlying rationale of Ofgem’s approach is that since they “control the infrastructure needed to trade energy and flexibility services”, DNOs “have the ability to restrict the activities of market participants by denying (or otherwise impeding) their network access”. DNOs should therefore not operate storage facilities, as they may be tempted to use their position to gain an unfair advantage over competing storage providers. This extends the conventional thinking that DNOs should not operate generating stations, and the principle that the monopoly and competitive parts of the electricity supply chain should be kept in separate hands – embodied in the “unbundling rules” set out in EU and UK legislation. Exceptions to the general principle are made in the case of emergency equipment such as uninterruptible power supplies. These would continue. It would also be possible for a company that formed part of a DNO’s corporate group to operate a storage facility subject to suitable legal separation from the DNO business and compliance with the existing unbundling rules. Ofgem does not close the door on a third category of exception to the general rule, which would have to be individually applied for where the market is not able to provide an efficient solution, storage is the most economic and efficient solution, and conflicts of interest are minimised. Guidance is proposed to flesh out these principles. Meanwhile, a way will be found to deal with the existing DNO owned and operated storage facilities built under Low Carbon Network innovation funding. DNOs are particularly well placed to know where storage would be most useful in their networks. It must make sense to regulate in a way that encourages competition in providing storage, even where its primary purpose is to improve the functioning of a DNO network. But the intensity of that competition will be determined in part by other ongoing regulatory workstreams (for a list, see the previous post in this series). Things may be starting to move a bit faster in the world of GB energy policy after what you could be forgiven for thinking was a Brexit-induced slowdown. On 24 July 2017, the UK government’s Department for Business, Energy and Industrial Strategy (BEIS) and the energy regulator Ofgem published a number of documents that reveal their evolving thinking about the future of the GB electricity system. These publications followed on from some significant initiatives by Ofgem and National Grid. This is the first of series of posts assessing where all this activity may be leading. The full holiday reading list from 24 July was as follows. The centrepiece was the BEIS / Ofgem response to the joint “call for evidence” on a “smart, flexible energy system” that they issued in November 2016 (CFE). As well as the response itself (the Response), there is a “smart systems and flexibility plan” (the Plan), ending with a helpful summary of the current state of play and next steps. Alongside the Response and the Plan, BEIS publicised some significant funding initiatives for battery technology under the umbrella of the government’s industrial strategy, on which the Secretary of State for BEIS, Greg Clark, gave a speech in Birmingham. The final contribution from BEIS was the innocuously titled “Capacity Market: improving the Framework” (the CM Consultation). Ofgem set out its “views on the design of arrangements to accommodate independent aggregators in energy markets” (the IDA policy paper), supported by an “assessment of the economic value of demand-side participation in the Balancing Mechanism and an evaluation of options to improve access” from Charles River Associates (the CRA Report). 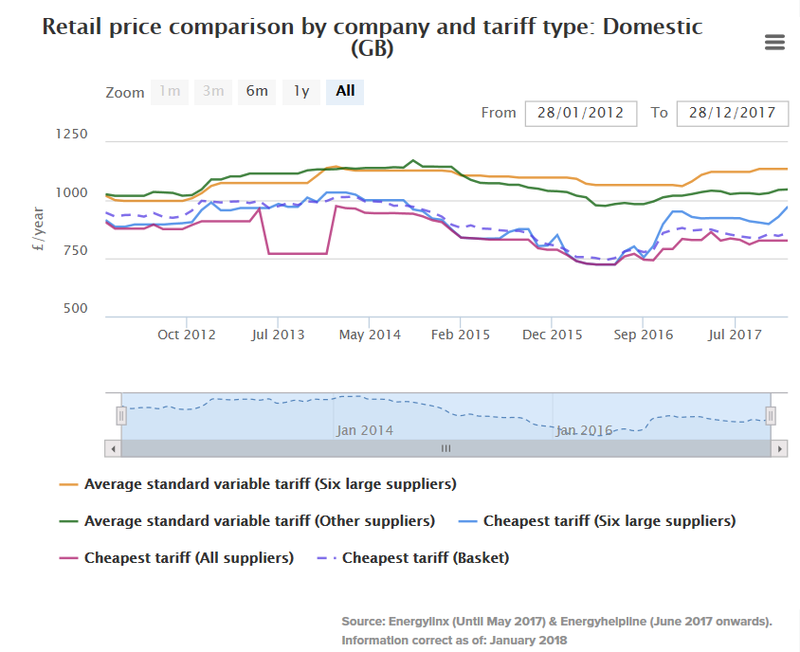 At the same time, Ofgem published work by Cambridge Economic Policy Associates on the distributional impacts of time of use tariffs (the CEPA Report). Finally, an Ofgem update and a launch statement and other documents kicked off a Significant Code Review on mandatory half hourly metering (the SCR Papers). National Grid’s “Future Energy Scenarios 2017” document (FES 2017), available here. The 2017 Report to Parliament – Meeting Carbon Budgets: Closing the policy gap from the Committee on Climate Change (CCC), as part of the supporting research to which the CCC published a Roadmap for Flexibility Services to 2030, prepared by Pöyry and Imperial College London (the Pöyry / Imperial Report). The Response and the Plan cover a broad range of subjects; many of the other documents are rather more monothematic. We will follow the topic headings in the Response, referring to the other documents where they are relevant. However, it is helpful to start by framing some of the key themes underlying this area of policy by turning to the Pöyry / Imperial Report. an expansion in the provision and use of demand-side response across all sectors of the economy. System flexibility, by which we mean the ability to adjust generation or consumption in the presence of network constraints to maintain a secure system operation for reliable service to consumers, will be the key enabler of this transformation to a cost-effective low-carbon electricity system. There are several flexibility resource options available including highly flexible thermal generation, energy storage, demand side response and cross-border interconnection to other systems.”. This explains why technologies and mechanisms that can increase system flexibility are a dominant theme in current GB electricity sector policy-making. But Pöyry / Imperial then go on to discuss the extent of the uncertainty that, based on their modelling, they consider exists about how much the main types of flexible resource may be needed on the way to achieving the CCC’s target. 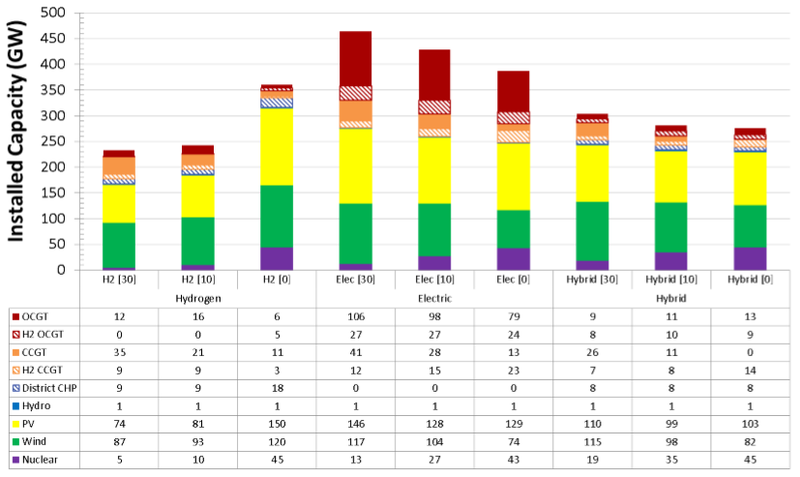 This is clearly shown in the table, reproduced below, setting out their assessment of “the required range of additional capacity of different flexible technologies to efficiently meet 2030 carbon intensity targets”. With the exception of interconnectors, the table shows the amounts of each flexible technology in the low and high scenarios, at each of the three dates, varying by a factor of 5 or more. As regards interconnectors, an illustration of the potential uncertainties in the different scenarios modelled by National Grid in FES 2017 is provided by the two FES 2017 charts below. The need for more flexible resources is clear, and Pöyry / Imperial calculate that integrating them successfully, as compared to the use of “conventional thermal generation based sources of flexibility”, could save between £3.2 billion and £4.7 billion a year in a system meeting the CCC’s 2030 target. But it is also clear that there are many different possible pathways that could be followed to achieve this level of flexibility, and that even if we get to 100 gCO2/kWh by 2030 – which is by no means guaranteed – there will inevitably be, at least relatively speaking, “winners” and “losers” in terms of which flexible technologies, and which individual projects, end up taking a greater or lesser share of what could be loosely called the “flexibility market”. 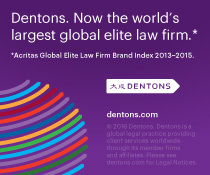 What will determine who wins or loses out most in this competition will be the same factors as have driven changes in the generation mix in the UK and elsewhere in recent years – in particular, the interplay of regulation and technological change. In 2016, as compared with 2010, the UK consumed 37% less power generated from fossil fuels and more than twice as much power generated from renewable sources: see the latest Digest of UK Energy Statistics. That shift is the result of subsidies for renewable generating capacity and reductions in the cost of wind and solar plants combined with other regulatory measures that have added to the costs of conventional generators. But whereas in the initial stages of decarbonising the generating mix, the relationship between regulatory cause and market impact has been relatively straightforward, making policy to encourage flexible resources is more complex: it is like a puzzle where each piece put in place changes the shapes of the others. This is perhaps why the actions recommended by Pöyry / Imperial as having a high priority, summarised below, all sound difficult and technical, and require a large amount of collaboration. We looked at the current issues facing the UK energy storage sector and recent market developments in some detail in a recent post, so we will not dwell too much on the background here. Storage – conceptually if not yet in practice – is the nearest thing there is to a “killer app” in the world of flexible resources. It has the potential to be an important asset class on a standalone basis, but it can also be combined with other technologies (from solar to CCGT) to add value to them by enabling their output to match better the requirements of end users and the system operator. In GB, as in a number of other jurisdictions, there is intense interest in developing distributed storage projects based on battery technology (for the moment at least, predominantly of the lithium ion variety), and a strong focus on doing so in a way that allows projects to access multiple revenue streams. There is also a general feeling that the regulatory regime needs to do more to recognise storage as a distinct activity but at the same time to do less to discriminate against it in various ways. So, what do the Response and the Plan tell us about the vision for storage? The Response points to National Grid’s SNaPS work, “which specifically considers improving transparency and reducing the complexity of ancillary services”. It also points to work that has been done and/or is ongoing to clarify how storage can be co-located with subsidised renewable electricity generating projects and to provide guidance on the process of connecting storage to the grid. BEIS / Ofgem note that they see no reason why a network operator should not “promote storage…in a connection queue if it has the objective of helping others…to connect more quickly or cheaply”, and point out that Ofgem can penalise DNOs who fail to provide evidence that they are engaging with and responding to the needs of connection stakeholders. BEIS / Ofgem highlight the proposals in the TCR Consultation on reducing the burden faced by storage in terms of network charges, notably the removal of demand residual charges at transmission and distribution level, and reducing BSUoS charges, for storage. A response to that consultation is to be published “in the summer”. In relation to behind the meter storage, BEIS / Ofgem observe that at present: “technology costs and the limited availability of Time of Use (ToU)/smart tariffs are greater barriers…than policy or regulatory issues”. This may invite the response from some readers that it is precisely a matter for policy and regulation to promote time of use / smart tariffs: the CEPA Report makes interesting reading in this context. BEIS / Ofgem “agree with the view expressed by many respondents” that network operators should be prevented from directly owning and operating storage” whilst slightly fudging the extent to which this may already be the case as a result of existing EU-based rules on the unbundling of generation from network operation, but “noting” the current EU proposals in the November 2016 Clean Energy Package to prohibit ownership of storage by network operators except in very limited circumstances and with a derogation from the Member State. Flexible connections “should be made available at both transmission and distribution level”. BEIS / Ofgem agree that the lack of a legal definition or regulatory categorisation of storage is a barrier to its deployment. Legislation will be introduced to “define storage as a distinct subset of generation”. This will enable Ofgem to introduce a new licence for storage before the changes to primary legislation are made. The “subset of generation” approach will also “avoid unnecessary duplication of regulation while still allowing specific regulations to be determined for storage assets” – such as whether the threshold for requiring national rather than local planning consent should be the same for storage as for other forms of generation. The prospect of storage facilities benefiting, as generation, from relief from the climate change levy is also noted – although since the principal such relief (for electricity generated from renewable sources) no longer applies, this may be of limited use to most projects. What the Response says about storage is typical of its approach to most of the issues raised in the CFE. If one wanted to be critical, it could be said that although, on the whole, BEIS / Ofgem engage with all the points raised by stakeholders, there is rarely an immediate and decisive answer to them: there is always another workstream somewhere else that has not yet concluded that holds out the prospect of something better than they can offer at present. On the other hand, perhaps that just highlights the points implicit in the Pöyry / Imperial Report’s recommendations: no one body can by itself create all the conditions for flexibility to be delivered cost-effectively, and it will be difficult fully to judge the success of the agenda that BEIS and Ofgem are pursuing for another two or three years. But wait a minute. On the same day as it issued the Response and the Plan, BEIS also published the CM Consultation. The sections of the Response on storage say nothing about this document, but it is potentially the most significant regulatory development in relation to storage for some time. The Capacity Market is meant to be “technology neutral”. 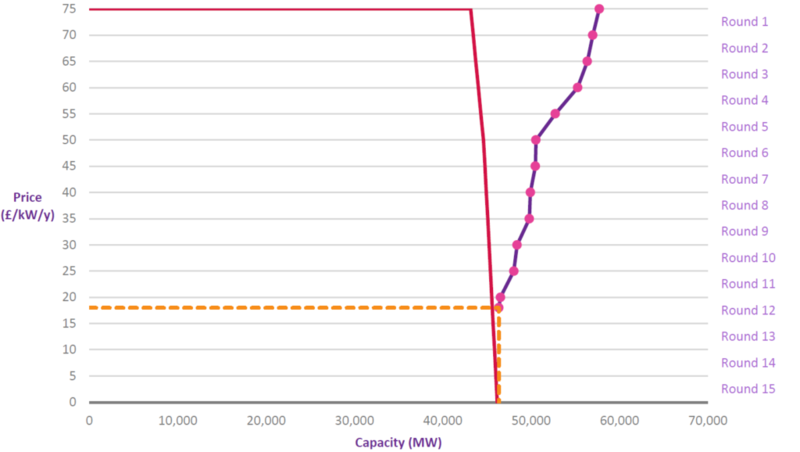 Above a 2 MW threshold, any provider of capacity (on the generation or demand side) that is not in receipt of renewable or CCC subsidies can bid for a capacity agreement in a Capacity Auction that is held one year or four years ahead of when (if successful) they may be called on to provide capacity when National Grid declares a System Stress Event. A key part of the calculations of any prospective bidder in the Capacity Market, particularly one considering a new build project, who is hoping that payments under a capacity agreement will partly fund its development expenses, is the de-rating factor that National Grid applies – the amount by which each MW of each bidding unit’s nameplate capacity is discounted when comparing the amount of capacity left in the auction at the end of each round against the total amount of capacity to be procured, represented by the demand curve. Some of the de-rating factors applied in the 2016 T-4 Auction are set out below. OCGT / recip Gas turbines running in open cycle fired mode. In the table above, storage has, for example, a de-rating factor approximately 10 percentage points higher than DSR and hydro and, if successful at auction, would receive correspondingly higher remuneration per MW of nameplate capacity than those technologies. The typical potential storage project competitor in the Capacity Market is now more likely to be a shed full of batteries than a pumped hydro station. This has prompted industry participants to question whether such a high de-rating factor is appropriate to all storage. Ofgem, in considering changes to the Capacity Market Rules proposed by stakeholders, declined to take a view on this, deferring to BEIS. BEIS, in the CM Consultation, finds merit in the arguments that (i) System Stress Events may last longer than the period for which a battery is capable of discharging power without re-charging; (ii) batteries degrade over time, so that their performance is not constant; (iii) a battery that is seeking to maximise its revenues from other sources may not be fully charged at the start of a System Stress Event. It proposes to take these points into account when setting de-rating factors for the next Capacity Auction (scheduled to take place in January 2017, and for which pre-qualification is ongoing), and splitting storage into a series of different categories based on the length of time for which they can discharge without re-charging (bands measured in half-hourly increments from 30 minutes to 4 hours). Bidders will be invited in due course to “self-select” which duration-based band they fall into. Of course, deterioration in performance over time is not unique to batteries – other technologies may also perform less well by the end of the 15 year period of a new build capacity agreement than they did at the start. And, as with other technologies, such effects can be mitigated: batteries can be replaced, and who knows by what cheaper and better products by the late 2020s. However, a fundamental difficulty with the CM Consultation is that it contains an outline description of a methodology, based around the concept of Equivalent Firm Capacity, but no indicative values for the new de-rating factors. It may be that BEIS’s concerns about battery performance have been heightened by the fact that the parameters for the next Capacity Market auctions show that it is seeking to procure an additional 6 GW of capacity in the T-1 auction (i.e. for delivery in 2018). There is reason to suppose that battery projects could make a strong showing in this auction, given their relatively quick construction period and the number of projects in the market, some of which may already have other “stacked” revenues (see our earlier post). Clearly it would be undesirable if a significant tranche of the T-1 auction capacity agreements was awarded to battery storage projects which then failed to perform as required in a System Stress Event. It is arguable that the three potential drawbacks of battery projects are not necessarily all best dealt with by de-rating. For example, the risk that a battery is not adequately charged at the start of a System Stress Event is ultimately one for the project’s operator to manage, given that it will face penalties for non-delivery. Nor is it only battery storage projects that access multiple revenue streams and may find themselves without sufficient charge to fulfil their Capacity Market obligations on occasion: pumped hydro projects do not operate only in the Capacity Market, and even though they may be able to generate power for well over four hours, they too cannot operate indefinitely without “recharging”. Moreover, National Grid is meant to give 4 hours’ notice of a System Stress Event, which may provide battery projects with some opportunity to prepare themselves. However, the real objection to the de-rating proposal is not that it is not addressing a potentially real problem, but that it is only doing so now – given that the issue was raised by stakeholders proposing Capacity Market Rules changes at least as long ago as November 2016 – and with no published numbers for consultees to comment on. The de-rating proposal illustrates a fundamental feature of the flexible resources policy space: one technology’s problems provide an up-side for competing technologies. Self-evidently, what may be bad news for batteries is good news for other storage technologies to the extent that they are not perceived to have the same drawbacks. Seen in this light, the CM Consultation appears to be the main (perhaps only) example of a policy measure that supports the “larger, grid-scale” storage projects (using e.g. pumped hydro or compressed air technology) about which the Response has relatively little to say. However, a few percentage points more or less on de-rating may not make up for the lack of e.g. the “cap and floor” regulated revenue stream advocated by some for such projects. In Part 2 of this series we will focus on the role of aggregators (featuring the analysis in the CRA Report on independent aggregators) and the demand-side more generally. The provisional results of the “early” Capacity Market auction held last week have now been published. This was an auction exclusively of 1-year capacity agreements, primarily to cover Winter 2017/18, after the UK Government decided that it did not want National Grid to carry on ensuring security of supply during Winter periods by means of a Contingency Balancing Reserve (CBR). The CBR involved auctions open to generators who would not otherwise be operating in a given Winter period and to demand side response providers. A Government consultation in March 2016 noted that the prices National Grid were paying under the CBR were increasing and that it introduced distortions into the market. From Winter 2018/19, of course, the Capacity Market itself will ensure security of supply. Those with capacity agreements beginning in 2018 will be the capacity providers who bid successfully in a four year ahead auction held in 2014, supplemented by those who win capacity agreements in any subsequent one year ahead auction for delivery in 2018. Last week’s “early” auction was a one-off bridge between the CBR (now operating for the last time to cover Winter 2016/17) and the fully-fledged Capacity Market regime. 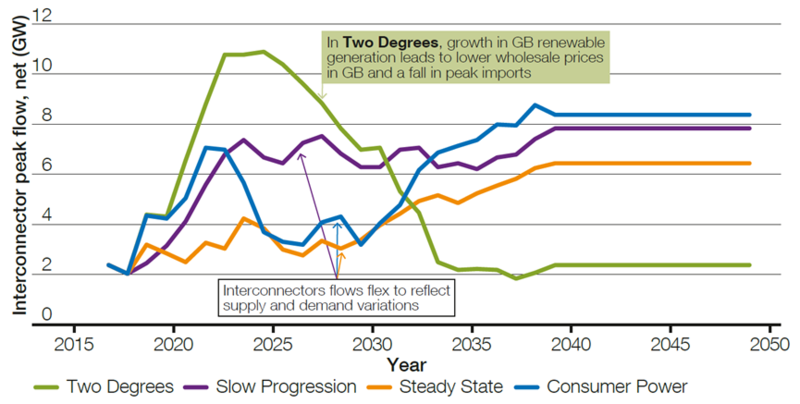 The key difference between the CBR and the Capacity Market is that the CBR (or at least the major part of it) focuses on securing capacity that would otherwise not be in the market, to fill the potential gap between existing generation and projected peak demand, whereas the Capacity Market provides a reliability incentive to all eligible generators and demand side response providers on the market. Commentary on previous Capacity Market auctions (such as this post from December 2016) has tended to focus on the failure of the four year ahead auctions to result in the award of 15 year agreements to meaningful amounts of large-scale new gas-fired generation projects. With new projects competing against almost all existing thermal generation, and new reciprocating engine projects able to bear much lower Capacity Market clearing prices than a CCGT project, the auctions have produced low clearing prices, but no obvious successors to the existing big coal-fired plants that the Government wants to close by 2025. How to evaluate the results of the “early” auction, then? The provisional results indicate capacity agreements going to 54.43 GW of capacity, at £6.95 kW / year, suggesting total costs to bill payers of around £378 million. This might look like spectacularly good value compared with the results of the last four year ahead auction (for delivery starting in 2020), where the clearing price was £22.50 kW / year for 52.43 GW of capacity. But that isn’t really a fair comparison, since about a quarter of the capacity that was awarded agreements for 2020 was new build, whereas less than 4 percent of the capacity awarded agreements in the “early” auction falls into this category. All the rest will be paid £6.95 for just continuing to operate – which presumably most of them would have done anyway. An alternative point of comparison might be with the costs of the CBR. The most recent Winter for which these are available is 2015/16, when National Grid spent just over £31 million on procuring, testing and utilising less than 3 GW of CBR capacity. Obviously a much inferior system. Close but no cigar? What’s different about the T-4 Capacity Market auction results of 2016? They say a picture is worth a thousand words, so rather than writing a lengthy post on the provisional results of the four-year ahead GB Capacity Market Auction, published on 9 December 2016 by National Grid, we are focusing on two pictures and inviting you to spot the difference between them. all bidders still in at that point get a capacity agreement at the clearing price. The big right to left moves occurred when the price moved between £35 and £30 and below £25. In particular, each of these moves saw 6GW of capacity drop out. It’s only an educated guess, of course, but it seems likely that much of the big leftward shifts in both auctions represented the exiting of bidders with plans to build large-scale proposed combined cycle gas turbine (CCGT) plants. As a group, they are almost certain to have higher per MW development costs than other categories of new build projects competing for capacity agreements (small gas or diesel projects based on reciprocating engines, open-cycle gas projects, or battery based storage). 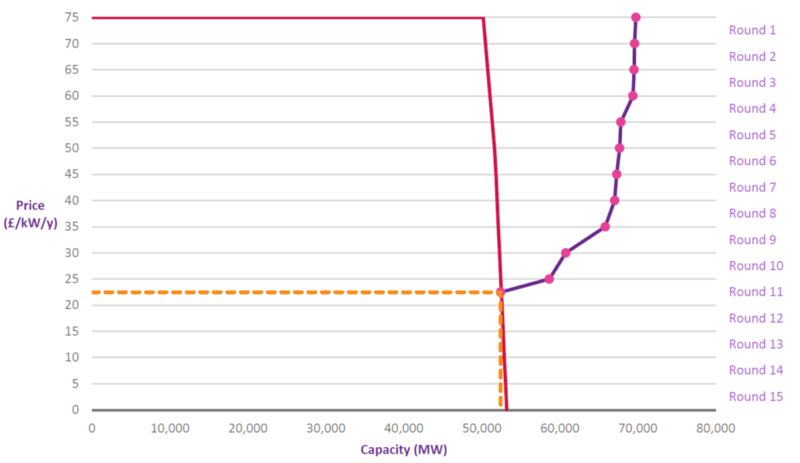 And the amount of capacity involved corresponds roughly with the big CCGT projects in the auction. lower gas prices and slightly higher projected wholesale power prices may make a low capacity market price more bearable for CCGT plant, and there may other ways to mitigate merchant risk through innovative trading arrangements. Maybe Ofgem’s warning wasn’t strong enough. Maybe the smaller-scale generators reckon that Ofgem’s bark will turn out to have been worse than its bite on this. In any event, the outcome has shown that for now, simply expanding the amount of capacity to be procured under an auction, as the Government appeared to be hoping when it adopted a limited change of approach to the 2016 auction, isn’t enough to ensure that some new GB CCGT plant is financeable and gets built. Instead, a somewhat higher price will be paid to all successful bidders, including existing plant, for a larger amount of capacity than the Government thought we really needed. As usual on these occasions, the Government has professed itself happy with the result of the auction, and it is fair to note that of the two new gas-fired plants with a capacity of around 300 MW that have been successful in the auction, one is described in the Capacity Market register as being CCGT. But if a new generation of big CCGT plants is an important part of our new lower carbon power mix, there is some way to go. A possibly more promising approach to using a capacity market to stimulate new CCGT build is suggested by the European Commission’s recent Winter Package of Energy Union proposals: set a date beyond which existing coal-fired plant will be ineligible for capacity market payments. This is not among the options canvassed in the Government’s recent consultation on achieving the closure of coal-fired plant by 2025. There would of course be an element of risk in adopting such an approach (coal plant might stay open because it can still make money without a subsidy, resulting in overcapacity, or alternatively coal plant might close immediately, before the new CCGT plant is built, leaving a generation gap), but it might be worth considering.